Medieval Horse Bridle Bit, c. 8th- 15th Cent....? Con/ sound and intact, cleaned and treated with rust nutralizer, all parts free and moving. Seller's Note/ Once the form of such 'snaffle' bits with cheek pieces was put into use in the late 1st millennium AD, there was little change in the following 2,000 years and are still in use today. We're just using an 'educated' guess as for the age of this bit. It could be Avar, Byzantine, Viking through Medieval. The large rein connector leads us to surmise that this was used for a cart or wagon harness. 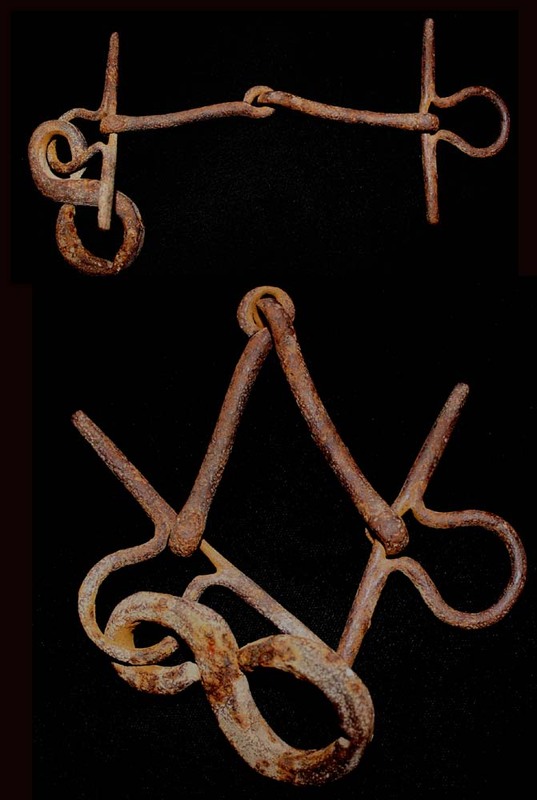 Either way, it's still a wonderful example of an ancient iron bridle bit and would look great in a shadowbox!